Over the weekend of 22-23 Sep the ASA hosted the Gold Cup and Inter Services Asymmetrics Champs at Thorney. Over the two days 6 races were completed resulting in an Army helm (with a civilian crew) winning the Gold Cup but the Navy winning the Inter Service title with the leading all serving crew. 10 teams competed, all sailing near identical 2000 Class dinghies. Four races were undertaken on the Saturday in light, shifting conditions. Initially the tide was slack leading to a fairly neutral beat but by Race 2 the tide was ebbing leading to favourable conditions up the left hand side of the course which only a few identified. Race 3 was a tense drifting affair with holes in the wind that cost a few unlucky sailors places. Race 4 was delayed by a near 180 degree wind shift accompanied by heavy drizzle which dampened down what little wind there was; once underway there was frustration for many as they struggled to get round the top mark laid in the middle of the ebbing tide. With very strong winds forecast for the next day the race Officer was lauded for his persistence in ensuring we got in all the races we did in case of the second day being blown out. On the Sunday morning the fleet set out from the lee of Thorney Island into a F5 with gusts to F6 which soon had 5 boats upside down before the first start. Most got away for Race 5, beating up a very choppy Thorney Channel with the strong wind blowing against a forceful flooding tide. As the leading boats rounded the top mark for the last time the wind was blowing over 30kts and only the first two boats avoided a dunking. The wind dropped back to the slightly more manageable F5/6 which enabled the start of what proved to be a punishing five lap Race 6. This certainly tested the remaining crews as once again only the first two boats stayed upright. Overall, the 2000 Class National Champion, Simon Horsfield (ASA) and his civilian crew Katie Burridge, sailed a commanding regatta with a win in very race. Second was Emma Hivey (ASA) and crew Chris Catt (civilian) closely followed in third by the Royal Navy Sailing Association’s (RNSA) Gavin Marshall crewed by Jennifer Cory (Saturday) and Will Jones (Sunday). As the first all serving crew Gavin and Jen/Will came out as the Inter Service Asymmetrics Champions and winner of the Forshaw Trophy for the leading RNSA crew. Other RNSA teams included Joe Howell & Coral Crouch and Kerry Marsden & Matt Irwin as well as Tom Bernal crewing in an ASA boat. 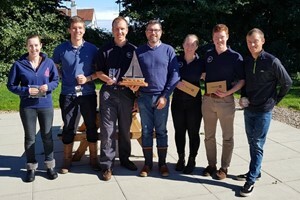 Following their win at the Inter Service Team Racing Champs, the Navy dinghy sailing team now holds two of the three Inter Service titles. Races from RN Sailing Centre, HMS EXCELLENT The 2019 Dinghy Racing Programme is now available online via RNSA website. There will be several races this year held on either Wednesday ..